If you’re not well-versed in the intricacies of Panerai watches, you won’t be faulted for thinking that they all look the same. It is true that the Florentine brand relies heavily on a few signature design traits and applies them to almost all their pieces. However, there are key differences between the various Panerai timepieces. So if you’d like to learn a little more about the watchmaker that the Royal Italian Navy once relied on, then read our quick guide to understanding the different Panerai watch collections. Although many Panerai watches look similar, there are key differences between the various pieces in Panerai’s lineup. 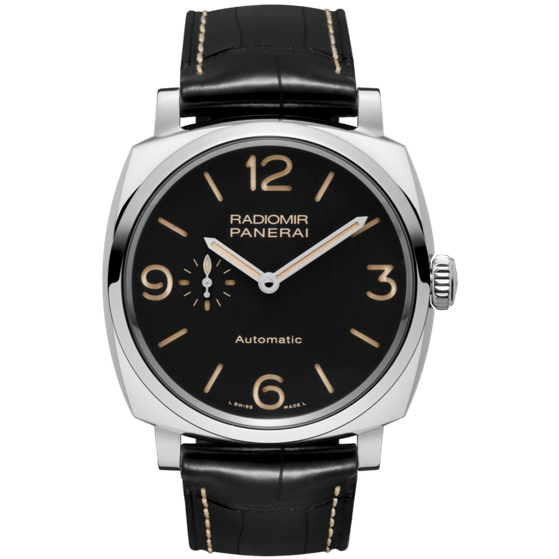 Panerai Radiomir Black Seal 8 Days – PAM00609 (Image: Panerai). The Panerai Radiomir watches are essentially the modern versions of the first batch of watch prototypes Officine Panerai created for the Italian frogmen in 1936. 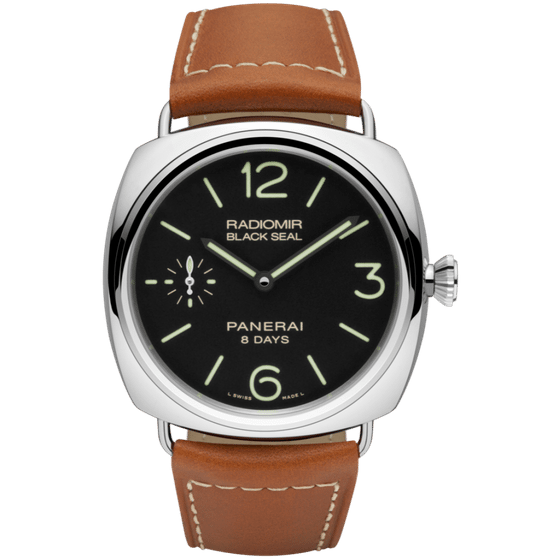 The name “Radiomir” refers to a luminous radium-based powder that Panerai patented in 1916. That powder (which is now understood as being highly toxic) was turned into a paste and used on Panerai instruments to enable them to glow in the dark. The defining characteristics of the original Radiomir dive watches include a massive 47mm waterproof cushion-shaped case with wire lugs welded to them, a simple dial with luminous hands and indexes, a manually-wound movement, an extra-long watch strap (to fit over wetsuits), and an oversized winding crown that could be manipulated while wearing gloves. Most of these design traits are still used on today’s Radiomir watches. Panerai Radiomir – PAM00572 (Image: Panerai). In the 1940s, Panerai modified their watch cases. Rather than having thin wire lugs welded onto the case, Panerai opted to make the entire case, including the broader lugs, from a single block of steel. The corners of the case were also slightly sharper than those on earlier models, and the winding crown was cylindrical rather than flared and cone-shaped. Today’s Radiomir 1940 watches are tributes to those vintage Panerai models. Panerai Luminor – PAM00372 (Image: Panerai). 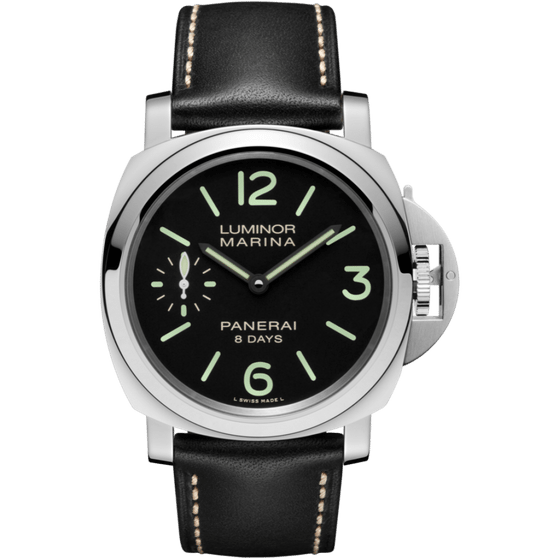 In 1949, Panerai patented another luminous material, which they called “Luminor.” Rather than being radium-based, the Luminor substance was tritium-based. A year later, Panerai creates a whole new case design with the now-iconic, lever-operated, crown-protecting bridge. 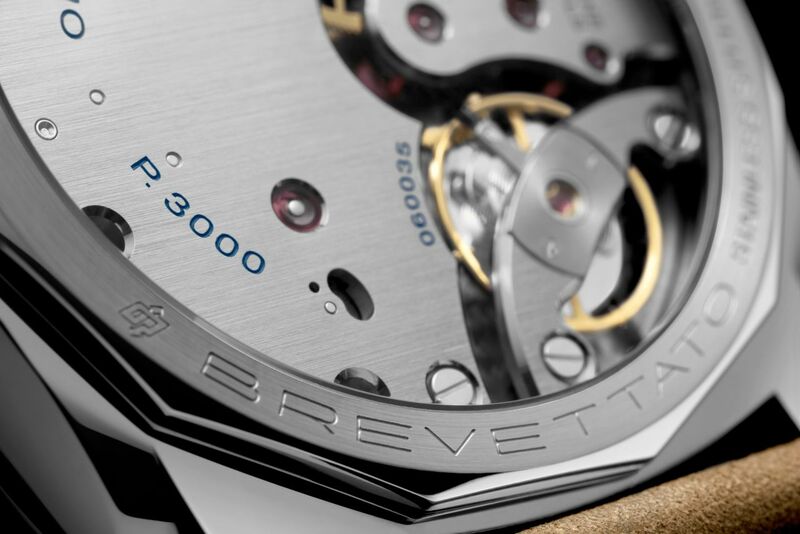 This mechanism ensures better water resistance for the watches. Similar to the preceding Radiomir watches made in the 1940s, the then-new 1950s Panerai watches also had the case and lugs fashioned from a single block of steel; however the bezels were wider and flatter. This case design serves as the inspiration for today’s Panerai Luminor 1950s watches (which were first released in 2002, almost a decade after the debut of the modern Luminor). It’s also worth noting that the crown guards of today’s Panerai Luminor 1950 include the “REG T.M.” engraving on them. Panerai Luminor 8 Days – PAM00510 (Image: Panerai). Panerai watches only became available for sale to the public in the 1990s, and it was Alessandro Bettarini (Panerai’s chief of mechanical engineering at that time), who after being inspired by Panerai divers from the 1950s, designed the modern Panerai Luminor in 1993. He brought back the crown-protector bridge from the archives and adopted the Luminor name from the old Panerai patents. In fact, Alessandro Bettarini had developed dive watch prototypes for the Diver Corps of the Italian Navy during the 1980s that used the crown-protector bridge. Those prototypes never went into production, but thankfully, some of those design elements reappeared on the future Luminor watch collection. 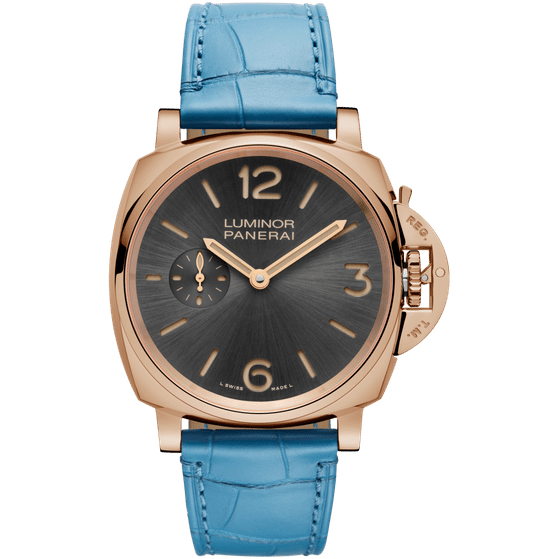 Today, the Luminor is Panerai’s flagship watch model and comes in a slew of sizes, materials, and complications. The watches retain the iconic cushion-shape case, crown-protector bridge (without “REG T.M.” engravings), and highly luminous dials. Panerai Luminor Due – PAM00677 (Image: Panerai). 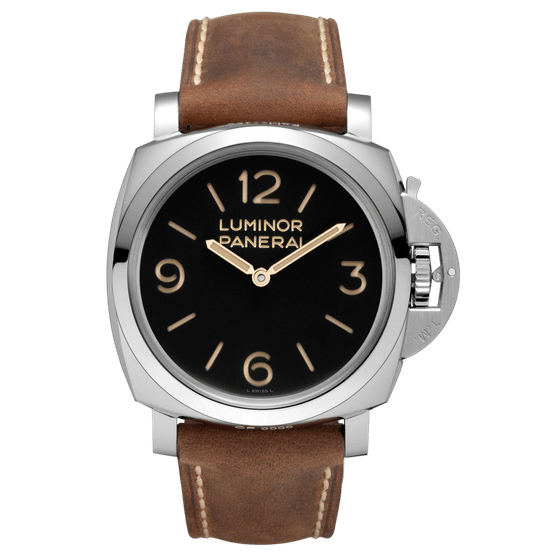 In 2016, Panerai unveiled the brand new Luminor Due collection, adding the Italian word for “two” to its name. With slimmer cases and smaller size options, the Luminor Due is positioned as an elegant alternative to the oversized and robust Luminor models. However, water resistance is much lower (30 meters), which has upset some Panerai purists who say that the Due watches stray too far from the company’s origins of making dive watches. Yet, the more restrained proportions of the Luminor Due have opened up the brand to a whole new audience (including more women!) who appreciate the more reasonable case dimensions. 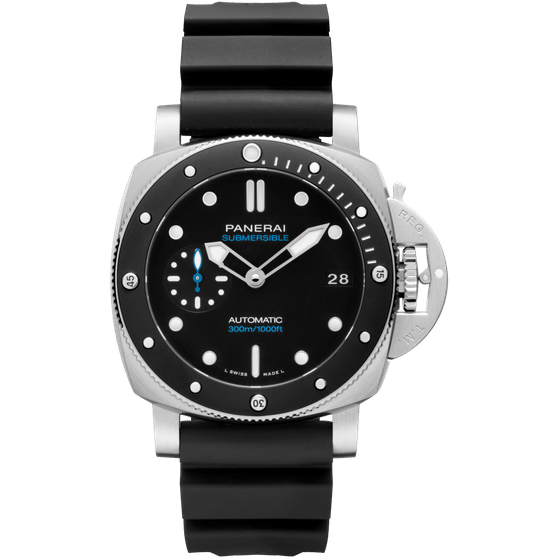 Panerai Submersible – PAM00683 (Image: Panerai). 2019 was the year of the Submersible at Panerai, with a whole host of new models presented at SIHH. In the past, the Submersibles belonged to the Luminor collection and were officially labeled as Luminor Submersible watches. However, this year Panerai dropped the Luminor label, and has now established the Submersible as its own collection. This is appropriate since the Submersible is actually a dive watch rather than a luxury watch inspired by diving. Panerai Submersibles come equipped with standard dive watch requirements such as unidirectional rotating bezels and waterproofness to 300 meters. There you have it; that’s our quick rundown of the main Panerai collections. So, the next time you’re out shopping for a new Panerai watch, you’ll be able to quickly differentiate between all the models like a Paneristi pro. Celine is a freelance luxury watch writer who has enjoyed working in the horology industry for over ten years. Like many of the high-end timepieces she writes about, she comes from Switzerland—the heart of fine watchmaking. From Singapore to Montreal to Geneva to Dubai to Amman, Celine has lived all over the world but now calls the beaches of Southern California home.